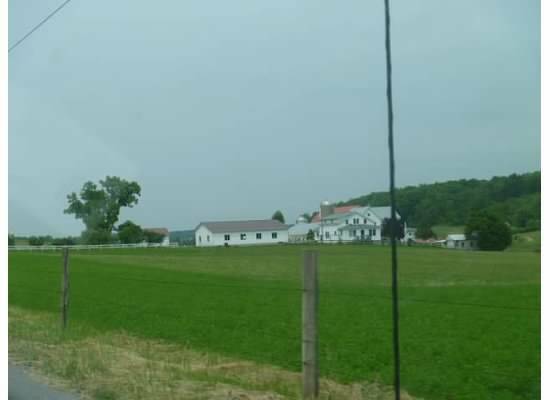 The scenic, serene rolling hills of Central Ohio are home to a large population of Amish, Mennonite and Quaker communities. Once or twice a year our family visits Amish Country in Holmes County, Ohio. Small towns like Walnut Creek, Sugarcreek, Millersburg and Berlin where the Amish and Mennonite live and work. The Quakers live a bit further south. 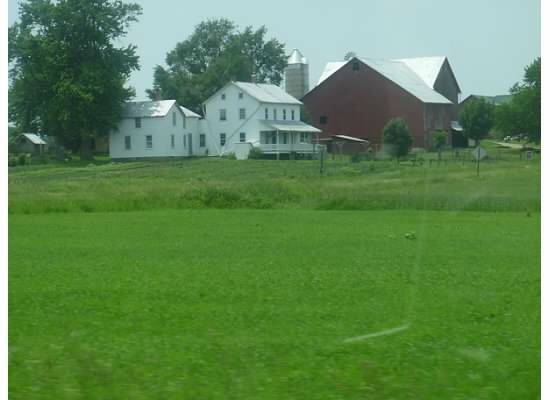 As you travel along the green, summery highways you can easily spot Amish and Mennonite houses and farms. Can you tell how from this photo? If you noticed that there are no electrical lines or TV antennas or satellite dishes you would be on to the answer. There is often another way. With no clothes dryers the laundry hangs on the line during the summer months. The housing itself is distinctive. The homes are quite large with boxy shapes, porches and small windows. No picture windows or sliding glass doors here. 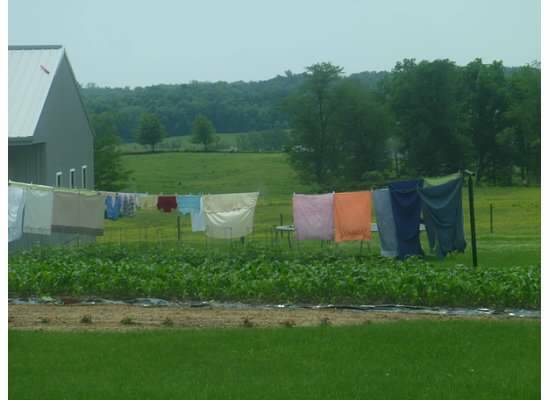 Would you know how to identify an Amish household as compared with a Mennonite household? 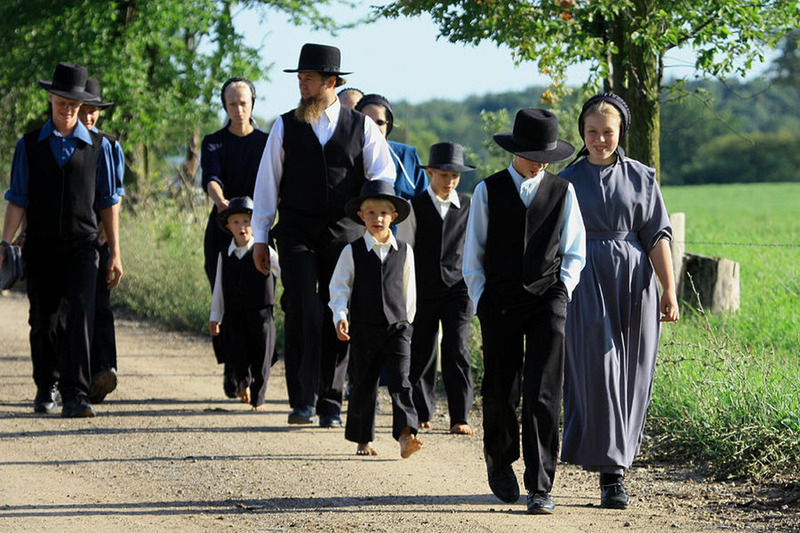 The Mennonites and Amish dress similarly with two exceptions. 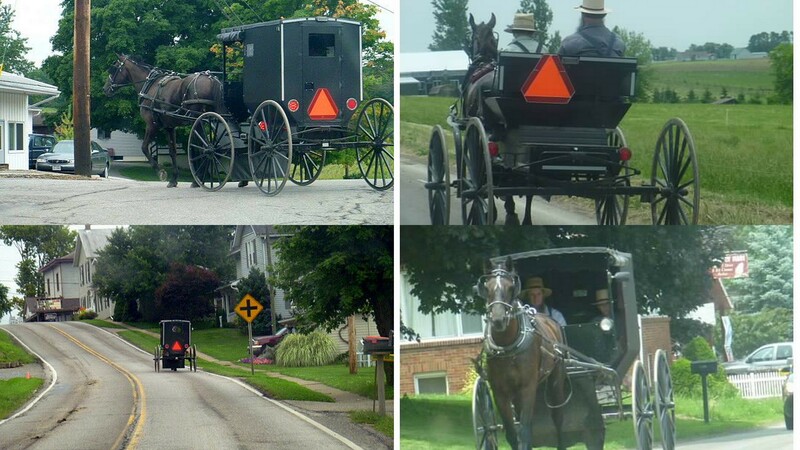 The Amish women wear black dresses with black caps though they wear white caps during the week. 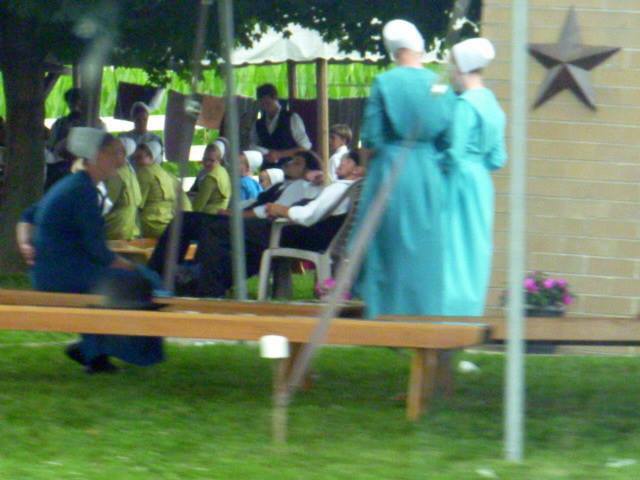 The Mennonite women wear more colorful and even print dresses and crisp, white caps. Though there can be exceptions to their wardrobe colors, the laundry on the lines generally reflects the colors of the household. 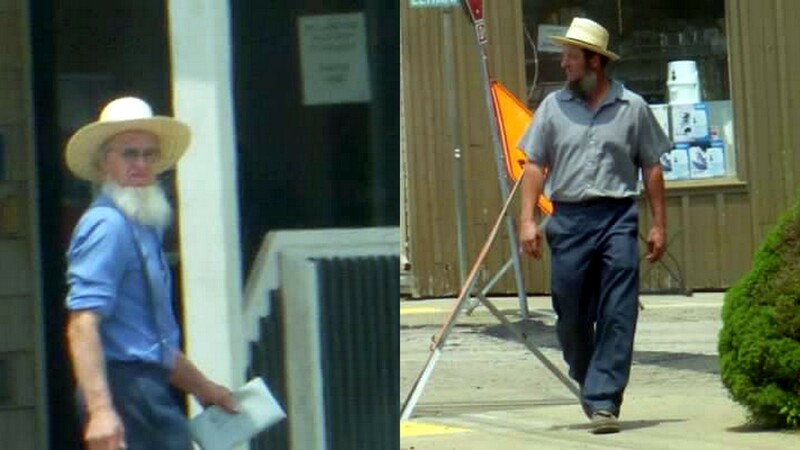 Amish men wear “blues,” suspenders and straw hats most of the time. These are every day and work clothes. Their Sunday-go-to-meeting clothing is strictly black and white with a bit of blue or grey into the mix occasionally. 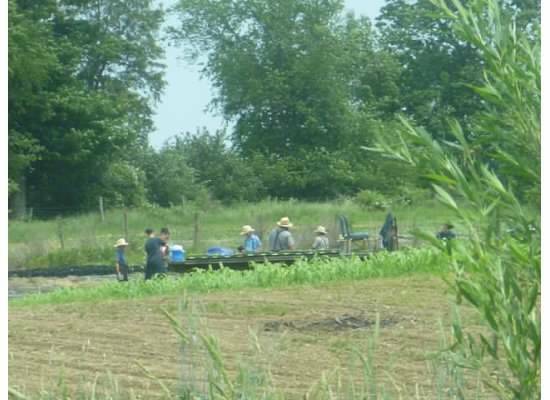 The Amish and Mennonites are all very hard working people. They are often the ones who serve in stores and restaurants in the areas they live in. They also farm and mostly the hard way. With teams of horses pulling ploughs and other farm equipment. They are famous for the quality of their horses which vary from large, strong work horses to the sleeker horses that pull their carriages. Their horses are very well cared for which is a time-consuming job in itself. People often give rescue horses to the Amish that aren’t always in great shape because the Amish will assist them to health and life in Amish Country. 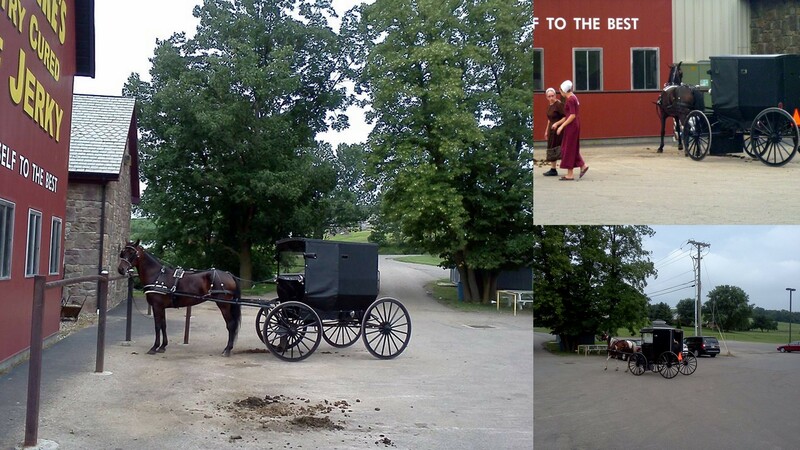 These communities are famous for their carriages and when you visit now you can ride in a carriage driven by true Amish. This is a recent adventure they have gotten into to assist tourists in enjoying their visit and to make some extra money. 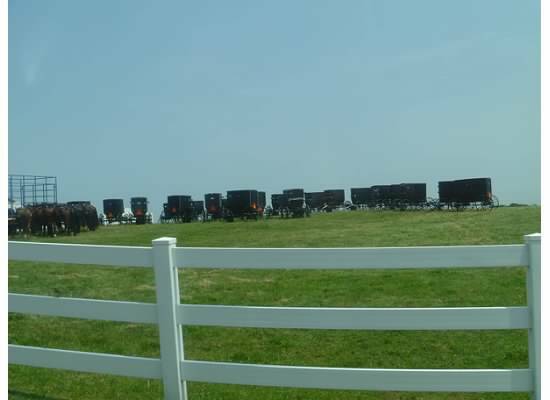 If you happen upon a Mennonite or Amish gathering like this one…..
Look around carefully as you will also find a gathering of horse-drawn carriages tied, tethered or just parked in a nearby corral. 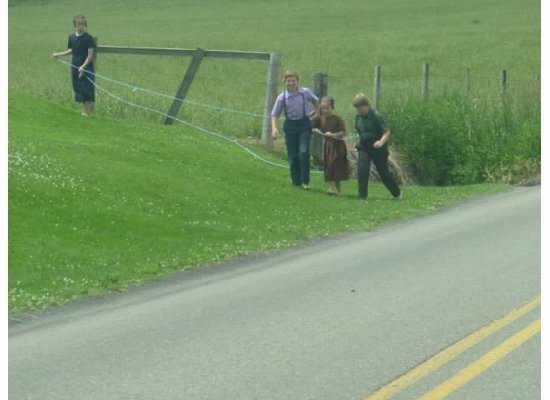 The Amish and Mennonites often walk to town. 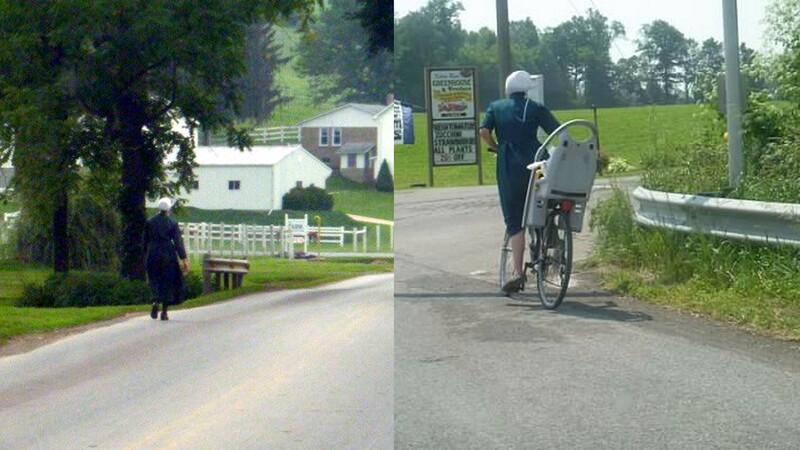 The Mennonites can be seen riding bicycles. You will regularly see both sects on the streets of the towns going about their business. Usually they just want to be left alone. They are not inhospitable, especially in the businesses and sometimes will wave from the fields. But you can imagine if they appeared to be friendly on the street how they would be bothered to the point of not being able to pursue their own needs. As previously stated, these hard working, devoted people are famous for both carriages and horses. Here you can see the beauty of both. In town and on the highways you will encounter carriages traveling along. In town you will see them easily but on the highways they can appear from all sides quite suddenly. Cresting hills is especially dangerous in a vehicle because you may abruptly encounter a slower moving horse-drawn carriage. They have heeded the state and county requests to put the red triangle slow moving vehicle signs on the backs of their carriages and also many now have lights on the sides at night to make them move visable in the dark. But there are still vehicle/horse & buggy wrecks that damage, kill and mame both humans and animals. 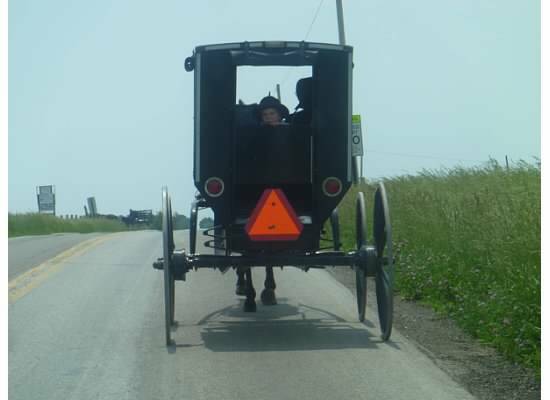 Relax, slow down and enjoy the ride, the countryside and the Amish. There’s no need to hurry when you are visiting here and you may well save a life. Be careful to stay out of the way. 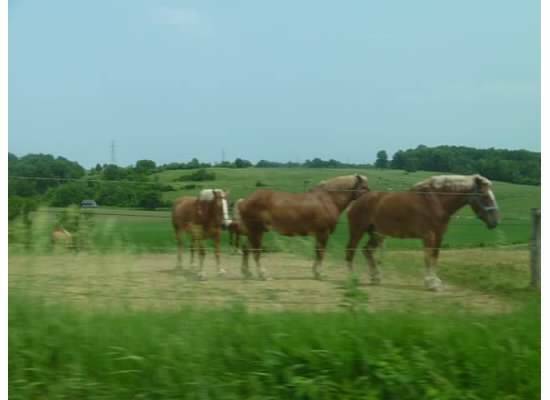 The horses on the highways and back roads are usually traveling at a fast trot and if you are not familiar with that pace of a horse you can be surprised as they approach or even as you pass by. Don’t honk or yell out. These well trained animals aren’t usually skitterish but it is always possible and remember the driver is working to keep his or her animal under control and focused on the road. Relax and enjoy the slow pace here. As we were heading out of Amish Country on one visit we followed a carriage with this young boy staring out the back window. He was probably curious about the “English” and possibly returning ‘stares’ from other encounters. We waved and smiled but he never changed his expression. We were charmed anyway. Really enjoyed your photos and explanation of the Amish & Mennonities in Ohio. Glad you enjoyed it, Marg!